I fear that with partnerships like AirBnb experiences we’re setting ourselves up to have our tourism product commoditized by foreign players who charge hefty commissions and leave providers struggling to survive. We could be doing more to support our own channels and ensure tourist dollars stay in Bermuda but I fear we put too much priority on growth. I suspect AirBnb Experiences will be great for a small operator who runs tours part time but for those trying to make a full time business out of it will be another pay to play channel expecting preferential treatment at a hefty premium. The Royal Gazette asked for my thoughts about the Contributory pension fund after some comments I made on twitter. A portion of those were published in today’s paper. Here is a copy of my commentary in full. The 2014 review of the Contributory Pension Fund predicted that in a best case scenario, the money would run out in 2049. As a stark example, this suggests that those born in 1984 who would turn 65 in 2049 would effectively spend their entire working lives contributing to a pension system from which they would not draw a penny. This is wholly concerning in that as our population ages and our elderly live longer, it places significant burdens on our younger working population to sustain a scheme that will be of no benefit to them. It is worthwhile to understand that this is in relation to the social insurance fees taken off your paycheck each week of $34.47 each from you and your employer. This does not mean your private pension which accounts for 5% of your paycheck matched with an additional 5% from your employer. Your private pension is dependent on the management arrangements and directions you make with your pension provider. Some changes have been made to increase contributions however at the same time, increases in pension payouts have also been made. Both the OBA and the PLP increased contributions and payouts in the last couple years. In order to make it more sustainable in the long run we will need to make hard choices of cutting back on pension payments, increasing the amount workers need to contribute, increasing the retirement age and finally, increasing our resident population. None of which are very palatable for many Bermudians. Whether any of these changes will make the pension system ultimately sustainable for future generations is uncertain. The sad reality is that Bermuda’s population is aging and as a result of our elders living far longer than expected when this pension scheme was originally devised means that it is very likely that eventually it will run out of money without drastic measures taking place. The Royal Gazette asked for my thoughts on MPs sleeping in parliament but unfortunately I didn’t respond in time for publication. Seeing as I haven’t posted recently I thought it best to post my responses. 1. Generally speaking, do issues such as MPs sleeping on the job and legislation beingtabled and debated on the same day represent serious problems with Parliament to you? MPs sleeping in parliament suggests our parliamentary system is not as effective as it should be. The idea that parliamentary debates run as marathon sessions into all hours of the morning is a symptom of a broken system. Legislation being tabled and rushed through in the same day simply doesn’t provide transparency to the people on changes. There is no chance for the average individual to review the legislation and provide feedback or comment on it and there is limited opportunity for politicians who have not had access to the changes to review and effectively comment on it. The legislation in this case may have been benign however it sets a very dangerous precedent for the future. What if the airport legislation had been passed this way? 2. Is the current Westminster system used in Bermuda the system we should be using? Is it at all antiquated? The Westminster system was designed for a time when knowledge and communications were limited. The people would elect representatives with whom interactions were somewhat rare. The people’s opportunities to be informed on larger issues were also limited. Thus, representatives would spend time informing themselves on issues as best they could and then verbally duel to see who could procure a stronger argument. Today however, the average individual holds more access to knowledge and potential for communications in their pocket than most global leaders have had access to throughout history. Democracy has transformed to become more participatory where representatives have gone from interacting with the people a handful of times during a parliamentary term to almost daily. The people often have access to much of the same information that our representatives do allowing far more to be wholly informed. The spectrum of public discourse and involvement has changed drastically with the advent of the internet. Thus, the roles and responsibilities of our representatives under the original Westminster system are no longeraligned with their original purpose. Our representatives need to transition from being expected to have all the answers and adept at dueling. The role is changing to one where they need to be more empowering and a mouthpiece of the people they represent. The trouble is that we haven’t figured out how to upgrade our democratic system to match modern times. The ineffectiveness of our democracy systems isn’t just a Bermudian challenge but a global one. Until we figure out how to improve this, we will struggle with declining trust in our representatives to do their jobseffectively. 3. What, if anything, should be done to prevent lengthy Parliament sessions – suchas Friday’s which lasted until nearly 3am? Is it about MPs speaking only on issues where they add something of worth to the debate? Is it about the Speaker keeping MPs on track? Perhaps Parliamentary debate has outlived its usefulness? It isn’t as if we try to win at cyber warfare by engaging in swordfights. Why then do we try to govern our island by way of verbal dual? Is this really the most effective means to govern in the modern age? 4. On Friday, Dennis Lister, the Speaker, blasted MPs for acting like a “classroom of schoolchildren” after images surfaced on sleeping MPs in the House. What was your immediate reaction when you saw those pictures? Dismay at what it indicates of the effectiveness of our present parliamentary system. 5. Mr. Lister said he had “no issue” with members that seem to have closed their eyesfor a moment – and that the real problem was the picture taking. Do you agree? Do you think Mr. Lister’s message at all fails to hold MPs to account for their behavior? Our politicians are human and expecting someone to stay awake until the early hours of the morning in marathon sessions is frankly ridiculous. Hiding this truth doesn’t fix anything and just means our leaders are anxious to deceive the people of what really is happening. Banning electronic devices is just a deceptive way of hiding the truth. More discussion is needed on why it happens, especially on both sides, and whether parliament is effective. Are politicians paid to sit in their seats for a set duration or to get things done? That kind of discussion will never happen as long as we rely on archaic technology bans and trying to hide the truth. How can we honestly expect to have informed debates if you are restricted from looking up anything on the internet? How can politicians stay connected to their constituents, empower them and keep them informed if they are restricted from the internet while in the house? 6. Is there anything you would like to see specifically addressed or changed with regards to proceedings when Parliament resumes in November? We should eliminate the electronic devices ban, introduce video live streams of parliament and start discussions on whether parliamentary processes need to be updated. One operator questioned the fact that in lean economic times, the former administration came up with millions out of the public purse for a boat race – the America’s Cup. This is coming up now, 11 months into a PLP government, as justification for why the government should throw money at the transportation system or risk a strike. This is a sentiment that came up regularly that many PLP supporters latched on to. That the OBA spent money on the America’s Cup when they should have been spending that money on schools and buses. It was a big theme used to fuel the belief that the OBA had money to fix the buses but spent it instead on a boat race for the rich. The trouble though is that now that the PLP is in government, this rhetoric may be coming home to roost. It is not all surprising that there is now a misconception that there is money to be found to fix the buses and that the PLP should come up with it. The trouble is, the America’s Cup spending was on economic stimulus that drove investment and spending on the island and created at least temporary jobs. Buying a new fleet of buses will hit government’s bottom line hard but will do very little to boost the economy. So, with the suggestion that the BIU has given a strike notice for June 29th, what will the government do? Hold firm, take the unpopular route of forcing some real changes to our transport system or cave and put us in the likely position of having to raise more debt just as interest rates are rising, the US fed is engaged in quantitative tapering and emerging market yields are rising. This may be the haunting reality of encouraging people to believe that there was money to be found but it was spent on America’s Cup rather than the buses. Where will that money be found now? It is interesting to read that the buses will be off the road on Monday as bus drivers protest the lack of buses, breakdowns, and working conditions. It raises the question of what happened with the changes to the bus schedules to make it more efficient and alleviate much of the strain. My understanding is that in 18+ years the bus drivers have yet to agree to and ratify any substantial changes to the bus schedules. There have been numerous attempts over the years to restructure the schedules to reduce reliance on overtime, make routes more efficient and reduce wear on the buses. In some cases, the union negotiators have agreed to the changes but when put to a vote among the bus drivers it has failed. It has been suggested that the requirement to put any schedule changes to a vote for approval for the drivers was part of the collective bargaining agreement of 98 or 99. This would suggest that the bus drivers are a key roadblock to the very things that they’re complaining about but it would mean cutting back on overtime. Perhaps I’m mistaken, but it’d be good to know the full story behind why it seems like we’ve had numerous announcements regarding a new schedule but one never seems to have appeared. Every time I’m accused of anti-PLP bias when I offer critiques I go back in time and discover gems like being called a “closet PLP supporter” and that I “lean PLP”. 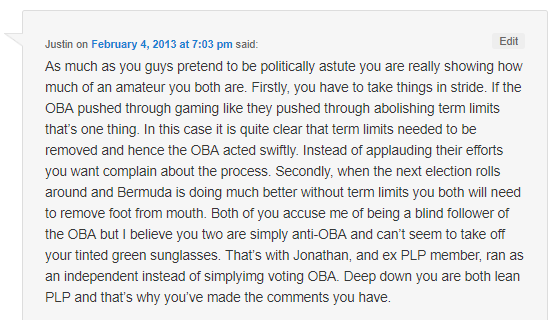 I thought I’d highlight a comment from back when I was critiquing the OBA’s lack of a consultative approach to immigration and term limits which ultimately blew up in their face. I guess in the end, rushing to scrap term limits didn’t bring the desired results after all. Are we damaging our cryptocurrency reputation before we’ve even started? While I am a supporter of the government’s overall efforts to embrace fintech and drive innovation in the cryptocurrency and blockchain space, it is absolutely essential that we take steps to uphold our reputation in the financial industry. The launching of a “pre-ICO” by a company founded and run by someone who sits on the blockchain and cryptocurrency task force before the new ICO law has passed and been made effective is exactly the kind of thing we don’t need. How can we possibly tout ourselves as an upstanding, reputable jurisdiction looking to bring a prudent and respectable regulatory approach if the people tasked with guiding it forwards can’t wait a few weeks for the legislation to be in place? The Royal Gazette asked for my thoughts on the release of Census figures highlighting the disparity between white and black workers on island. Portions of my comments were included in an article in today’s paper. What jumped out at me personally was the disparity in annual personal income between white and black members of the public. Do you think this is part of the reason why the PLP’s emphasis on “two Bermuda’s” resonated with the public? What should government do to address this imbalance, and are they on the right track? Below I have included a complete copy of my response. Income inequality is a major factor in political movements all around the globe. Lower income people feel left behind and disadvantaged by globalisation and economic policy that rewards the rich. The PLP’s emphasis on “two Bermuda’s” certainly contributed to their electoral success as not enough was done by the OBA to bridge this divide. The same could be said of the previous PLP government as the reason for the OBAs meager victory in 2012. Bridging the divide is a generational issue that requires long term focus on measuring the right statistics and addressing the root causes. It is rather obvious that we have a troubling divide of income inequality in Bermuda, especially between the races. We certainly didn’t need the census to tell us that. However, one of the challenges we face is thoroughly understanding and addressing the root causes of these divides. Too often we sensationalize misleading statistics without accepting that they tell an inaccurate and incomplete story. The vast majority of our statistics and trends are published comparing black and white or Bermudian and non-Bermudian. Our reliance on a large expat workforce can distort these numbers and turn people against the very things that could help address the root causes of our problems. Unfortunately we rarely compare statistics and trends by race and status such as black Bermudian vs. white Bermudian. By not doing so we distort the picture of true income inequality which makes for an easy target for short term political gains but an impossible problem to solve in the long term. For example, let’s consider the PLP’s recent announcement that cryptocurrency exchange Binance will create 40 jobs on island. It has been suggested that 30 of those jobs will be Bermudian so 10 of them will be non-Bermudian. The likelihood is that the majority of those 10 non-Bermudian jobs will be highly skilled, highly paid positions filled predominantly by white people. While Binance has made a very welcome pledge to invest in training and education, that will take time and the 20 Bermudian jobs are more likely to be support roles. While those support roles are likely to be more representative of our local demographics they are unlikely to be as well paid as the non-Bermudian jobs. 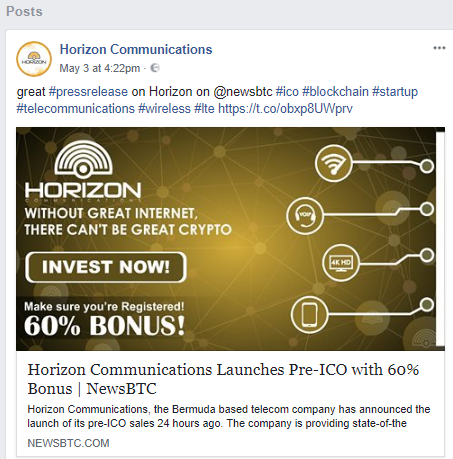 Now let’s consider the PLP has considerable success in attracting cryptocurrency and fintech businesses to the island and generates many, many jobs. In a few years time, when the next census comes out, what would we read? White incomes rose considerably while black incomes rose modestly. Would that be a fair analysis? Should the PLP in that case be blamed for not addressing income inequality and making whites richer? Personally I think that would be unreasonable. The challenge we face is that we are reliant on foreign investment and skilled labour to create jobs on island. We could certainly insist that these new cryptocurrency and fintech businesses recruit non-Bermudian staff that match our own demographics, however that would act as a deterrent to those businesses creating jobs here. We desperately need growth and new jobs. So, solely comparing black and white is a poor means to measure our racial income inequality problem when we rely on foreign investment and workers who distort those numbers. Instead we need to focus on measuring the Bermudian racial inequality problem so we can identify whether or not we’re achieving our aim of reducing racial income inequality. Very thankfully, the 2016 census contains a breakdown of income by race and by status. What this means is that by the time the next census is complete, our benchmark for success should be whether the income gap between black Bermudians, mixed/other Bermudians and white Bermudians has narrowed or has widened. Narrowing the racial income inequality gap among Bermudians needs to be the target of any Bermudian government. Focusing solely black and white numbers is great for political rallying but poor for driving long term results. We cannot solve global inequality but we can most certainly do more to solve Bermudian inequality. As such, I am very encouraged and hopeful that the pledges to incorporate funding and support for educating Bermudians on this proposed new fintech industry will do more to provide opportunity for all Bermudians and help narrow the gap. Blockchain may be an inefficient and over hyped variation of existing distributed computing… does it matter? When it comes to building software, cloud systems architects are the present day luminaries. These guys are the ones dealing with some of the most challenging aspects of computing today: distributed systems. Building software that can scale globally across time and space is insanely difficult to get right. These are the guys who actually achieve it, so when they talk about Blockchain, its worth listening. It is worth understanding that fundamentally, Blockchain is basically an alternative solution to challenges in distributed computing. Many of the “innovations” behind recent blockchain advances are really only reapplying well known computing concepts from the distributed computing space. So, when someone like Clemens Vasters, a lead architect for Microsoft’s Azure cloud platform, talks about Blockchain and compares it to distributed computing, it’s worth listening. The core of his argument is that blockchain effectively represents a neat packaging of a few core distributed computing concepts. He suggests it has novel application for a handful of use cases but ultimately is inefficient as a solution for many problems compared to other practices, approaches and techniques of distributed computing. In a nutshell, he struggles to see how blockchain “is even remotely as significant as the hype wants to make us believe.” He has a point. Blockchain, just like big data, AI, Internet of Things are over hyped tech buzzwords to which few really fundamentally understand but many are excited about. Technology isn’t magic. If you sprinkle Blockchain or AI on a broken process it doesn’t fix the process. Technology is a tool, not the solution. Yet far too few people really understand this fundamental point. If you have garbage inputs or processes then you’re still going to end up with garbage coming out no matter what technology or buzzwords you throw at it. So, Blockchain may just be one massive over hyped buzz word. It is understandable that leading distributed computing luminaries are scratching their heads wondering how it is any different or better than what they’re already doing. Though a better question is whether it really matters if its an over hyped buzz word? From a Bermuda perspective, I don’t think it does. We are in a position to capitalize on considerable interest and investment in tackling distributed computing problems. Call it what you like, what matters is people are actively investing in solving problems. What would you think if I were to tell you that in my early teens I was looking up information for school projects, chatted with people all over the globe and hosted massive multiplayer online games. Nothing special right? The big difference is that I was doing all that in the early 90s on telnet before the World Wide Web gained traction and long before the internet became what we know it as today. What is commonplace and accessible for everyone today was a highly technical niche accessible to few back then. If you told me back then that people would be able to do all of these things 20+ years in the future I may have scratched my head confused as to what stops everyone if it was already possible with technology of the day? It was absolutely possible, just accessible only to the few who understood how to do it. Is it possible to solve most of the problems posed as targets for blockchain based solutions using existing technology? Yes, it is. Are those technologies more efficient and better suited technologies as solutions for those problems? Yes, in many cases they are. Are those technologies accessible to the average developer such that solutions can be built at scale? That’s where I’m not so convinced. Speaking as a tech professional, distributed computing is hard and we lack the platforms to make it accessible for mass consumption and problem solving. So why does Blockchain, as an inefficient, over hyped technology have appeal? Well, for one it is about the sheer amount of investment capital, open source community support and will of the community backing not just it, but a focus on distributed computing based solutions in general. That investment and interest is the kind that could drive tremendous change in making distributed computing problems significantly more accessible. That alone, has tremendous value as it means far more people will be able to solve problems they otherwise wouldn’t be able to. So, yes, blockchain is over hyped. Does it matter though? 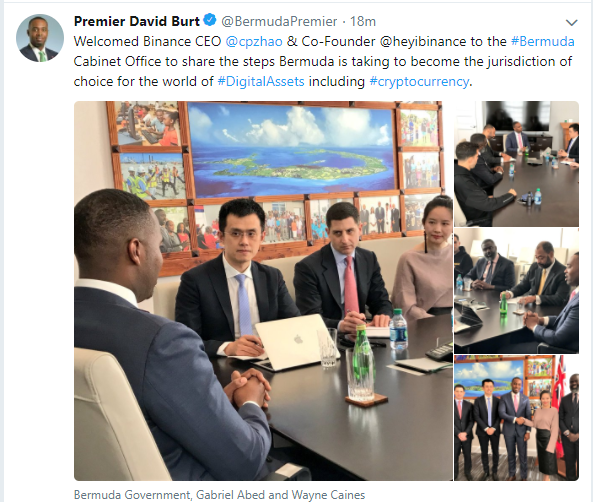 The Premier just posted a photo of himself and other members of the Cryptocurrency task force meeting with the CEO of Binance. It is yet another sign, alongside Minister Caines meeting with Joseph Lubin that Bermuda is being taken very seriously by the crypto community. However, as I’ve long suggested, Bermuda’s greatest opportunity is providing a stable reputable and streamlined regulatory environment for new industries to flourish. It isn’t Bermuda’s place to judge whether crypto, blockchain and DLT tech is the future, it is Bermuda’s place to align itself to provide the right regulatory environment that legitimizes it in a way that is compliant with existing financial regulatory standards. We could certainly take the approach of avoiding all risk and watching as our island stagnates as we keep trying to kick the can down the road. Or, we could embrace the opportunity and stand firm on remaining a top tier reputable jurisdiction knowing that there are companies out there very keen to find such a place to do business. In that regard, I’m about half way through the consultation document the BMA has produced and so far I wholesale and very impressed with what I’m reading. One can only wonder though, if the photo above represents how pleased the Binance representatives are in finding out that we’re very set on remaining a reputable jurisdiction. We’re certainly not Malta in that regards.